Shopping for Twilight Zone Statues? 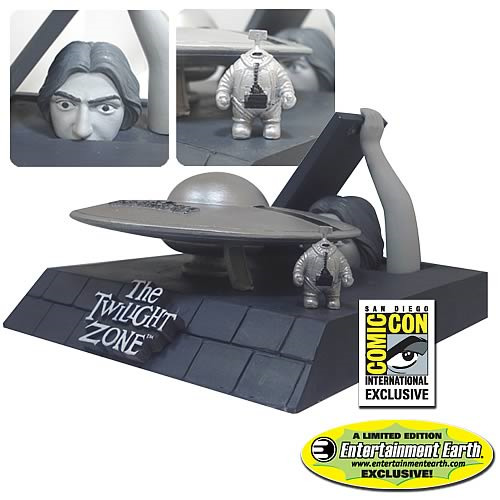 Exclusive statue based on the sci-fi TV series The Twilight Zone. This diorama recreates the memorable episode that starred Agnes Moorhead. Features an Invader, his space ship, and the giant in a rooftop scene. Order this one-of-a-kind collectible today! Entertainment Earth Comic-Con Exclusive! Measuring 6 1/2-inches deep x 5-inches wide x 3 1/2-inches tall, this incredible black-and-white diorama recreates a moment from the memorable "The Invaders" episode of The Twilight Zone that starred Agnes Moorhead. The resin statue features a diminutive Invader, U.S. Air Force Space Probe No. 1, and a rooftop scene complete with fearsome giant. Order this one-of-a-kind collectible today! Limited edition of 750 pieces. Ages 14 and up. Note: This item will first be available to purchase in person at San Diego Comic-Con. Online orders will ship after San Diego Comic-Con, while supplies last. "These are the invaders, the tiny beings from the tiny place called Earth, who would take the giant step across the sky to the question marks that sparkle and beckon from the vastness of the universe only to be imagined. The invaders, who found out that a one-way ticket to the stars beyond has the ultimate price tag. And we have just seen it entered in a ledger that covers all the transactions of the universe, a bill stamped 'paid in full,' and to be found, on file, in the Twilight Zone."